Experts in baking rusks for babies and toddlers. One Rusk provides 20% of your baby's daily iron requirement. For maximum freshness twist or seal the inner foil bag., Store in a cool dry place., For best before date see base of pack. 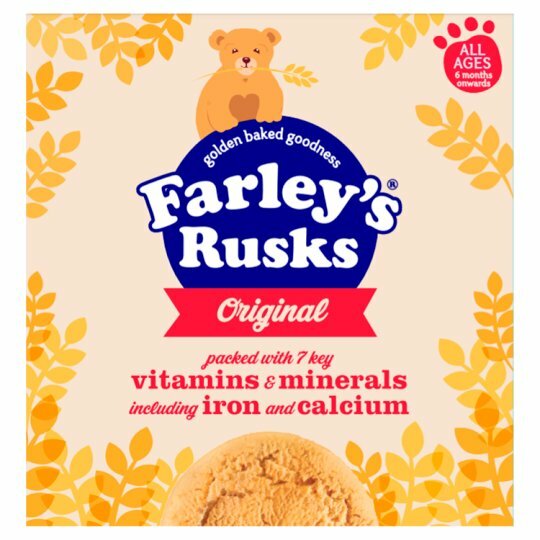 Rusks are a great way to gradually introduce your baby to solid foods. Simply crush in a bowl and mix with your baby's usual milk to form a puree for a first cereal. OR mix with fruit puree, custard or yogurt for a yummy dessert. OR great as a delicious finger food to encourage self-feeding, hand-eye coordination, biting and chewing as your baby develops. Always make sure that a responsible person is present when your baby is feeding. Your Health Visitor or Doctor can advise you on infant feeding. REMEMBER TO BRUSH TEETH REGULARLY. USE AS PART OF A VARIED WEANING DIET. In all correspondence please quote the quality code on the base of pack.